Looking for an app that can help your child who is deaf learn to read? 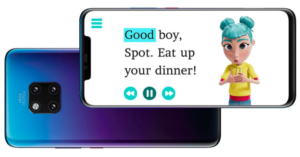 Huawei has created StorySign, a new storytelling app that uses artificial intelligence, a digital avatar, and sign language in order to help these children learn to read. StorySign is simple to use: first, the child or parent opens the app and selects a book from the StorySign library. Next, they hold their phone up to the words on the page and Star, a friendly avatar, signs the story as the printed words are highlighted. This allows parents and children to learn to sign and read together at their own pace.